Disclaimer: Caroline here, and I’d like to start off by saying, if you haven’t seen Pacific Rim yet, this feature will contain spoilers. If you don’t care, read on. If you haven’t seen this awesome film, directed by Guillermo del Toro, do so. 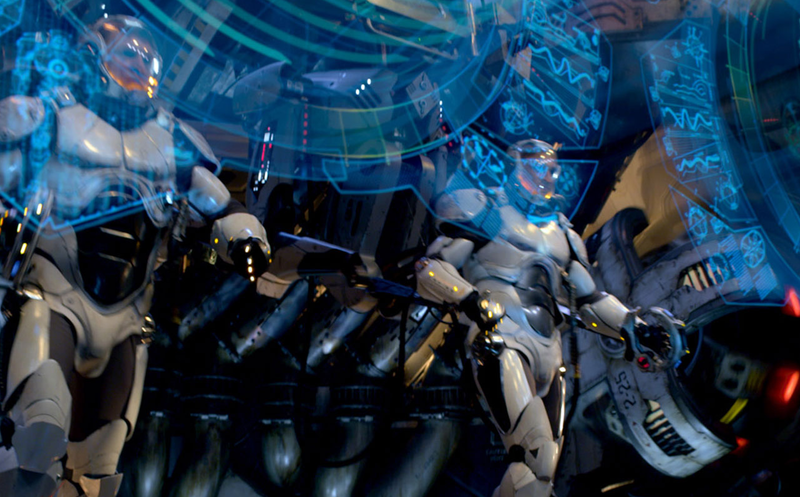 Also, all images used here are sourced from the Pacific Rim official movie website. 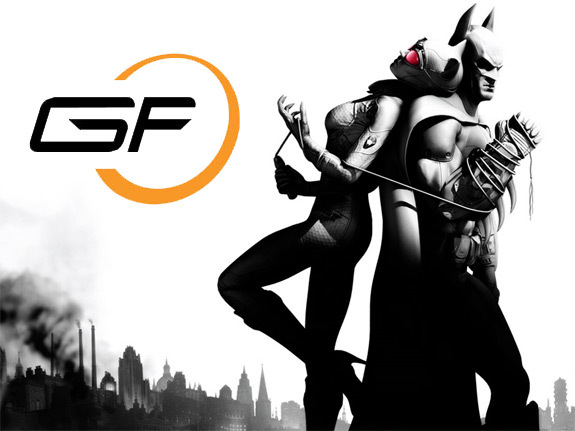 These images are properrty of Legendary and/or Warner Bros., and we’re just using them for reference of ultimate-ness. I am in love with Pacific Rim. It is probably one of the most simple and straightforward embodiments of the mecha-genre of media: badass soldiers trying to save the world, scientists with their crazy theories, and massive mechas fighting giant monsters! With a 72 percent on Rotten Tomatoes, the film is entertaining and wildly exciting. Of course, I’m not here to give you a review on the film. I’m here to talk about the hero mecha, Gipsy Danger, a competitor in the MBS Ultimate Giant Robot bracket. In the (actually-rather-near) future of Earth, between 2013 (yes, this happened already) and 2025, monsters called kaijus begin to attack earth, entering our world through a portal in a fissure in the Pacific Ocean (not to be confused with the Ring of Fire). In response, the nations of the Earth (finally rallied under a common enemy), pooled its resources to create the Jeager program. The giant robots of Earth are called Jaegers. Jaeger, as the opening credit sequence to the movie informs you, is “hunter” in German. Jaegers fight kaijus, and you get some really awesome robot fight scenes. Gipsy Danger, the main robot-character of the story, is an Ultimate Giant Robot. So what makes the Gipsy Danger an Ultimate Giant Robot? More after the break. Jaegers are unique, which I think is the first selling point as to why Gipsy Danger, our competitor, is one of the most Ultimate Giant Robots: Jaeger’s need 2 pilots. Now, I know what you’re thinking. “Caroline, doesn’t this make it less-awesome?” Well, sure, but let’s consider how the Jaeger is piloted. It’s actually pretty cool, considering how “real” it can be. The beginning of the movie, there is a sequence describing the background and development of the Jaeger program. Jaegers are not controlled by joysticks or steering wheels, but by embedding into the human neurological system (i.e., the pilots’ brains) and mimicking the same signals into the machinery of these massive robots. The neural load of piloting is too much for one human to endure. The scientists and engineers in the Jaeger program remedy this by splitting the neural load between two pilots; essentially the pilots being the left and right sides of the brain. The pilots, however, must be “drift compatible”: they need to think alike have similar reflex timing, and a bunch of other test points we really don’t learn about in the movie (we only see the Mako-Raleigh sparring scene where they dance very well together). When you watch the movie, you see the pilots synchronously walk and fight in the massive, metal hulks. Some controls are offered by a holo-screen interface or panels of buttons. Crimson Typhoon - who was unfortunately knocked out of the bracket - is piloted by three pilots (one for each saw-blade arm, I suppose). While the bracket does not really focus on the skill of the pilots, there is something to be said for a very sophisticated control system and one as well thought-out as the Jeagers’ systems. Some of our other Ultimate Giant Robot Bracket competitors that have pilots - Metal Wolf and Gundam Wing 0, for example - have a system that you just take at face value (levers, buttons, joysticks, whatever; hell, we don’t even know how the president fits inside Metal Wolf). I can only imagine that simulating pilot movements make for more fluid, more reactive controls than someone sitting in a cockpit constantly manipulating various controls. I believe the 2-pilot drift system is something not really seen in other mechas or robots, making Gipsy Danger stand out against the competition on the bracket. Gipsy Danger is one of the bigger robots of our bracket. (Yeah, I can’t say we stack up against Gurren Lagann when it comes to size… depending on which phase of Gurren Lagann we’re talking about, of course). Giant robots and mechas are so hard to scale, since they are sometimes very lax to make way for cool cinematography, easier animation, etc. Some of our robots fall deep into this flaw of changing size making it rather confusing to tell how big they actually are across different media (I’m looking at you, Optimus Prime). We can specify from what movie, comic, or show to try and get specific, but even then their scale can change within that reference. 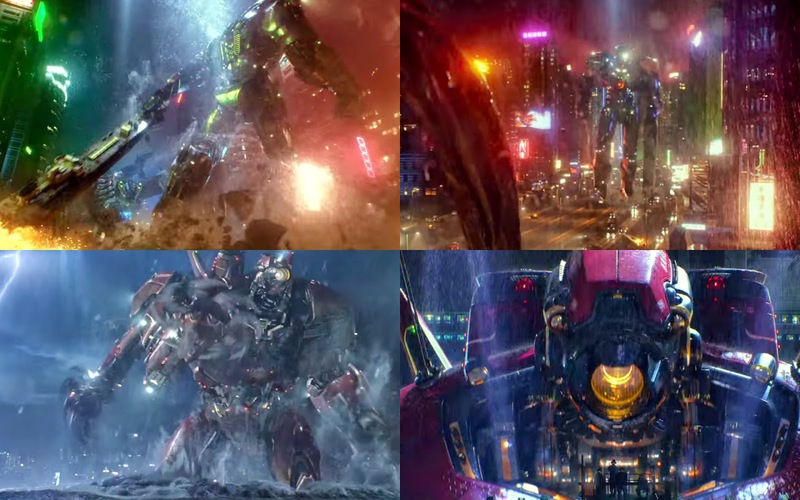 Pacific Rim did a great job of trying to stay as consistent as possible when it came to size. We pretty much know how big Gipsy Danger and her companions are. In a video interview featurette, Guillermo del Toro mentions the size of the mechs being, “250-foot high,” and many of these robots seem to be around that size, depending on which model. Gipsy Danger herself seems around the height, maybe a bit bigger, seeing her against some high-rises in Hong Kong. I included some video screenshots at various points in the movie of the different Jaegers, showing the consistency of scale, as well as the scale itself. Gipsy Danger is big enough to use a huge tanker boat as a baseball bat, large metal storage shipping containers as brass knuckles, and barely have to wade through the seas of the China coastline. Jaegers are big. I’ll be honest: when it comes to Ultimate Giant Robots, size matters. Every Jaeger in the movie is different. Crimson Typhoon had 3 arms with saw blades at the end; Cherno Alpha is a giant tank boxer; Striker Eureka is fast and agile. In the same video featurette I linked earlier, del Toro says Gipsy Danger was made to be a big, giant, robot cowboy, and it shows: she’s got shoulder guns and awesome Iron Man-like repulsor blasts, extra pistons for punching, and freaking snap-to swords (alright, maybe that last one isn’t very cowboy-like; but they were a new addition). Even the improvised coolant-release is helpful in the Hong Kong battle. Gipsy Danger is probably the most well-rounded Jaeger, since it also has some temporary boosters to help it sprint or leap great distances, similar to Striker Eureka (though not as optimized in form, like Striker). One other (final) weapon is her core. Gipsy Danger is one of the older Jaegers of the program, only updated for the second act of the movie (she’s “better than new”). Some of the later models have been updated to use electricity (though probably not Cherno Alpha, since it’s a Mark I model, but Cherno meets its demise before the kaijus’ EMP attack, so we don’t get to see if its updated). The EMP attack knocks out Striker Eureka’s controls, which cues Gipsy to go in. Gipsy Danger is run by a nuclear reactor core, allowing it to not be affected by the EMP attacks that the kaiju have at their disposal. We really don’t know what the other robots in the bracket are run on, but we can probably assume gasoline and electricity. Gipsy Danger, and possibly Optimus Prime (since he’s a weird bio-robot-lifeform?… I won’t get into it), would be left standing if there were an EMP attack. In the end of the movie, they use this to their advantage as well. Striker Eureka is put out of commission by the kaijus guarding the Pacific Rim portal, but it has the nuclear payload bomb. Getting past the portal, Gipsy fills in this gap of being the bomb, and she is set to self-destruct to close to portal. With Gipsy Danger’s sacrifice, Earth is cut off from the world of the Kaiju’s and their masters, thus saving humanity. Some of our robots hunt super heroes (Omnidroid and Sentinels) - not cool. Others are for personal vendettas against other people or the military - Metal Wolf and Gundam Wing 0. Some try to coexist with humanity, but sometimes need to fight against humans: Optimus Prime and The Iron Giant. Robots that save the world? Pretty ultimate. I guess I can put Gurren Lagann here, too, but I can’t even get too in-depth about that story, since my knowledge is wiki-deep; besides, Gipsy Danger is grounded in a sort of reality, whereas my reaction to Gurren Lagann: I can’t even. Hopefully you can see why Gipsy Danger is very deserving of Mad Bracket Status’ Ultimate Giant Robot title! She’s a big, badass, world-saving roboto with kickass pilots and big guns. What’s not ultimate about this mecha? Join me and #TeamGipsyDanger! Get at me and MBS on Twitter (@clineamb and @madbracketstat) and tell us why you’re #TeamGipsyDanger! I listened to the entire Pacific Rim Original Soundtrack while working on this article. Take a listen. Nearly all persons realize that a wholesome well-balanced eating plan along with exercising are generally the proper way to shed weight, crossword puzzles but also for several battling to reduce pounds they're looking at weight loss pills. There's a large number of weight loss pills out there for example otc along with doctor prescribed tablets.